Concrete screws are hardened screws with a double lead—consisting of alternating raised and lowered threads with notches cut into the raised threads—and a diamond-shape, nail-type point. Special carbide bits are recommended for drilling pilot holes prior to driving concrete screws into masonry. Value Fastener stocks flat Phil steel blue Ruspert concrete screws and hex washer slot steel blue Ruspert concrete screws in a variety of sizes and lengths to meet your needs. The blue Ruspert finish is a specialized ceramic material that allows concrete screws to also be used in pressure-treated lumber. This corrosion resistant coating is comprised of three layers: metal zinc, a chemical conversion film, and a ceramic surface which is baked to a smooth, high quality finish. We have the right blue Ruspert concrete screws for your project. See individual product listings for additional information and specifications. Order masonry screws today, request a quote, or contact us to learn more. When installed in concrete, concrete screws can be removed and re-driven into the same holes. This process can be repeated almost indefinitely—in most cases, the concrete will give out before hardened masonry screws will. In addition to their use in masonry, concrete screws are popular for a variety of other anchoring applications, as well. 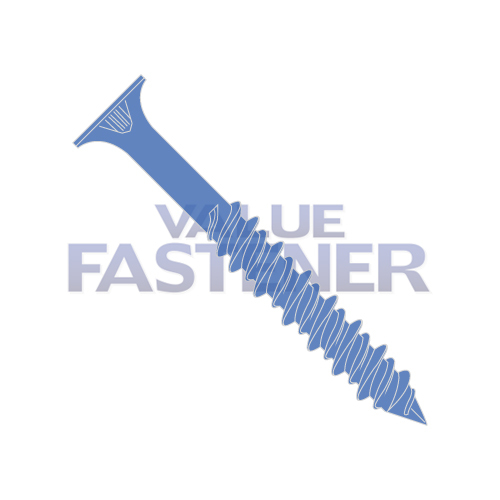 If you’re looking for masonry screws, look no further than Value Fastener. We have the blue Ruspert concrete screws your application requires, as well as a massive selection of other screw options. Order today, request a quote, or contact us for the concrete screws you need.